Concept: This group represents mid to late successional softwood Vegetation Types (VT) found on zonal sites within the Acadian Ecosite group. Red spruce, hemlock and white pine are the dominant trees. Balsam fir is usually associated with earlier successional stages, but is present in all stands at some stage of development. Regenerating overstory species, herbs typical of upland softwood forests and an extensive moss layer make up the understory. Mid successional stages are usually even-aged whereas late successional stages can develop uneven-aged characteristics due to the longevity of hemlock and red spruce. Vegetation: Shade tolerant softwoods (red spruce, hemlock, balsam fir) and to a lesser extent shade intermediate softwoods (white pine, white spruce) dominate these closed canopy forests. The shrub layer is mainly regenerating overstory species, but on the poorer sites lambkill and blueberry are also common. Typical woodland flora (e.g. bunchberry, sarsaparilla, wild lily-of-the-valley) are common in the herb layer, with bracken also found on poorer sites. The bryophyte/lichen layer is dominated by Schreber's moss and stair-step moss. Bazzania is also common where coarse woody debris is high. Environmental Setting: Vegetation types in this group are found on a range of slope positions. Most sites are non-rocky, but surface stoniness can be variable. Soils are mainly derived from glacial till deposits. 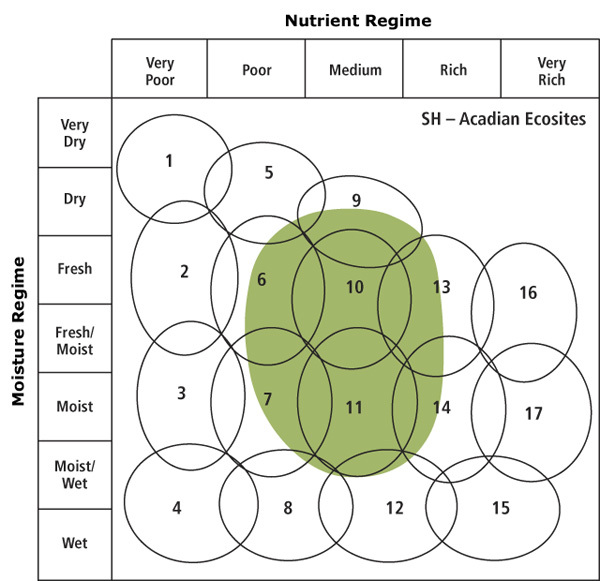 A wide range of moisture levels can be found, but fertility is generally in the medium range. Various VTs form the matrix forest or large patches in many ecodistricts. This group is found throughout the province except in the Cape Breton Taiga (100) and Atlantic Coastal (800) ecoregions, with limited occurrence in the Cape Breton Highlands (200) ecoregion. Successional Dynamics: This group is associated with mid and late successional zonal VTs. Mid-successional stages usually have a significant component of balsam fir in the overstory along with red spruce, black and white spruce and are typically even-aged. Late successional stages are dominated by hemlock, red spruce and white pine and will develop an uneven-aged structure between infrequent stand-level disturbance events. Disturbance agents include hurricanes (windthrow), fire, insects and harvesting. Ecological Features: These Acadian ecosystems occur as large patch or matrix forests over much of mainland Nova Scotia's lowland and upland ecoregions. The high shade tolerance and longevity of the dominant trees support well developed canopies, large and/or tall boles and snags, complex vertical structures and abundant coarse woody debris. Many VTs in this group can persist as climax forests with inherent mechanisms of self renewal and old growth development. The group can dominate some landscapes, providing large expanses of interior habitat and high landscape connectedness. Flying squirrels, American marten, fisher, deer and moose, snowshoe hare, bear, bats and diverse communities of birds and invertebrates use these forests for shelter, foraging and/or reproduction. Rare plants are somewhat uncommon but high invertebrate diversity, extensive fungal networks and rare lichens may occur, particularly in older forests.